AutographsForSale.com offers soccer cards, programs and other men's and women's soccer collectibles with prices starting at $2.50. We have items from U.S. Soccer, the World Cup, the old WUSA league and the Women's World Cup. 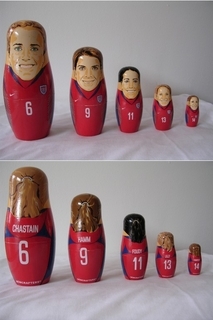 Featured at right is a Mia Hamm, Brandi Chastain, Joy Fawcett, Julie Foudy and Kristine Lilly nesting dolls set.